This month I was introduced to Cook with Sara. I moved to C week this month; a week earlier than before and a fresh new set of blogs to fall in love with. Sara’s from the midwest and loves to cook and eat (I’m sure we’d get a long fine). Sifting through her blog I found a recurring love that we shared: banana bread. While Sara had her standby banana bread, which I adapted this recipe from, she had plenty of other variations. I was curious: how would coconut oil work with bananas? Even crazier–muffins! The results were nothing to be ashamed of. I swapped the vegetable oil with coconut oil, cut the sugar a bit and as a last minute decision, coated the unbaked batter with a sprinkling of sweetened coconut flakes which toasted up beautifully while cooking. Um, can you say tropical paradise? Preheat oven to 350°F. Spray muffin pan with cooking spray or use muffin liners. In a large mixing bowl, with an electric mixer, cream together the oil, applesauce and sugar. Mix in the bananas, eggs and vanilla. In a medium bowl, sift flours, cinnamon, baking powder, baking soda and salt. Add the flour mixture to the mixing bowl alternately with the buttermilk, and mix just until combined. Using an ice cream scoop, divide batter into a greased prepared muffin tins. Sprinkle each muffin with shredded coconut and bake for 25 minutes or until a toothpick inserted near the center comes out clean. Cool in the pan for 15 minutes, then remove and cool completely on a wire rack. These look delicious! I have a jar of coconut oil too and have been wondering what to use it for. Thanks! Thanks! Coconut oil can basically be subbed for most any oil. I’ve tried in baking and stir fry and it’s worked great! Welcome to Group C! Your muffins look divine, being a muffin addict I know my stuff! Welcome to the group! 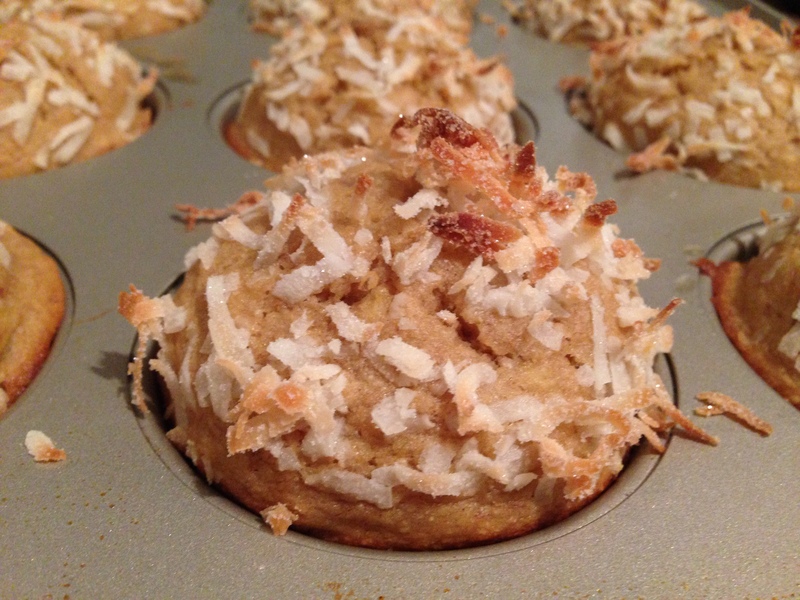 These coconut muffins look delicious, I love baking with coconut oil! I had a great time hanging out on your blog! Thanks for adding to my salt obsession!!!!! I love when that happens, having all the ingredients. My husband will randomly find me in the kitchen working on some crazy project because I just read a blog and had everything ready to go. Oh, I’ve made these and they ARE delicious. Now I need to make them again. Big fan of coconut oil, and I love the flavor with banana! Great idea using it in the muffins and adding coconut on top. Love how it got all toasty! The coconut was a last minute decision. I had it sitting around and figured why not?! I collect muffin recipes to make with my daughter and this is definitely a new combo for us to try out – love the flavor of coconut oil – you are right, a tropical paradise! Thanks Deanna. My only problem with the recipe is because they’re so moist, they don’t keep very well. 3 days tops. With the humidity we’ve had, I kept them in the fridge between bites. Thanks Sophie. Yeah, coconut oil scares me a bit, just not really knowing what to do with it, but excited for the adventure of trying.